Humankind has always been fascinated by how bees build their honeycombs. Pappus of Alexandria (around the year 320) was interested in this subject from a mathematical point of view. In his 'Mathematical Collections', Book V, he deals with isoperimetry: the comparison of the areas or volumes of figures of the same perimeter or surface area. A kind of problems of optimization. '...first collecting the sweets of the most beautiful flowers which grow on the earth, they make from them, for the reception of the honey, the vessels which we call honeycombs, (with cells) all equals, similar and contiguous to one another, and hexagonal in form. And that they have contrived this by virtue of a certain geometrical forethought we may infer in this way. They could necessarily think that the figures must be such as to be contiguous to one another, that is to say, to have their sides common, in order that no foreign matter could enter the interstices between them and so defile the purity of their produce. Now ontly three rectilinear figures would satisfy the condition, I mean regular figures which are equilateral and equiangular; for the bees would have none of the figures which are not uniform... There being then three figures capable by themselves of exactly filling up the space about the same point, the bees by reason of their instinctive wisdom chose for the construction of the honeycomb the figure which has the most angles, because they conceived that it would contain more honey than either of the two others.' (You can read more about Pappus in note 16 of the book 'The Six Cornered Snowflake' or in Sir Thomas Heath's book 'A History of Greek Mathematics' [Dover, 1981]). In his beautiful book 'De Nive Sexangula' (written in 1611), Kepler studied the shape of the snowflakes, the pomegranate and much more. And he was interested in the shape of honeycombs. But not only the hexagonal structure but also the bottom. 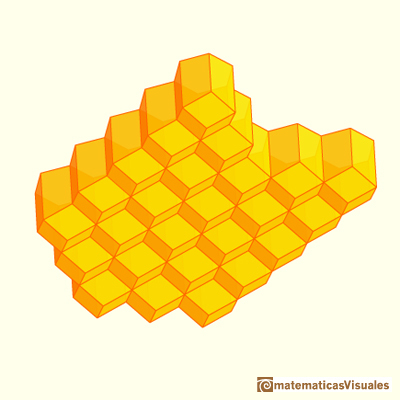 'If you should ask the geometers on what plan the cells of bees are built, they will reply, on a hexagonal plan. The answer is clear from a simple look at the openings or entrances, and the sides thar form the cells. Each cell is sourrounded by six others, and is divided from the next by a shared side. But if you observe the bottom of each cell, you will notice that it slopes into an obtuse angle formed by three planes. This bottom (which you might call the "keel") is joined to the six sides of the cell by six other angles, three higher ones that are trilateral, just like the bottom angle of the keel, and three lower ones, in between, that are quadrilateral. It also be observed that the cells are arranged in two layers, with the openings facing opposite directions; the backs adjoining one another and closely packed; and the corners of each keel in one layer fitted into the three corners of the three keels in the other.... The three planes of the keel are identical to one another, and their shape is what geometers call a rhombus'. (Johannes Kepler, 'De Nive Sexangula'). 'The most famous of all hexagonal conformations, and one of the most beautiful, is the bee's cell. As in the basalt or the coral, we have to deal with an assemblage of co-equal cylinders, of circular section, compressed into regular hexagonal prisms; but in this case we have two layers of such cylinders or prisms, one facing one way and one the other, and a new problem arises in connection with their inner ends. We may suppose the original cylinders to have spherical ends, which is their normal and symmetrical way of terminating; then, for closest packing, it is obvious that the end of any one cylinder in the one layer will touch, and fit in between, the ends of three cylinders in the other. It is just as when we pile round-shot in a heap; we begin with three, a fourth fits into its nest between the three others, and the four form a "tetrad", or regular tetragonal arrangement. This construction with rhombi is related with a polyhedron that is called Rhombic Dodecahedron. Kepler was the first mathematician who wrote about this polyhedron. 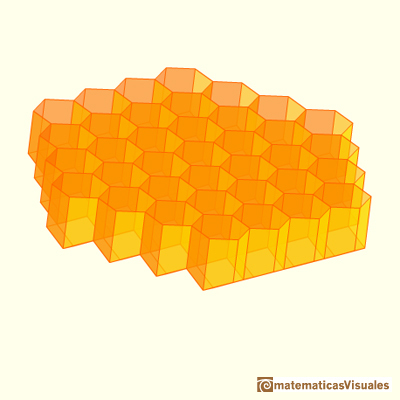 The following months we are going to study more properties of honeycombs and the Rhombic Dodecahedron. We can build a beautiful box inspired in honeycombs. You can download the template and build a model with cardboard. The designer of this box was John Edminster and you can find references in Beach Packaging Design. In this second version of the applet you can build more cells or only one. Johannes Kepler - The Six Cornered Snowflake: a New Year's gif - Paul Dry Books, Philadelphia, Pennsylvania, 2010. English translation of Kepler's book 'De Nive Sexangula'. With notes by Owen Gingerich and Guillermo Bleichmar and illustrations by the spanish mathematician Capi Corrales Rodrigáñez. D'Arcy Thompson - On Growth And Form - Cambridge University Press, 1942. George Hart's wonderful web site..
We want to close a hexagonal prism as bees do, using three rhombi. Then, which is the shape of these three rhombi that closes the prism with the minimum surface area?. The Rhombic Dodecahedron fills the space without gaps. A chain of six pyramids can be turned inwards to form a cube or turned outwards, placed over another cube to form the rhombic dodecahedron. A cuboctahedron is an Archimedean solid. It can be seen as made by cutting off the corners of a cube. A cuboctahedron is an Archimedean solid. 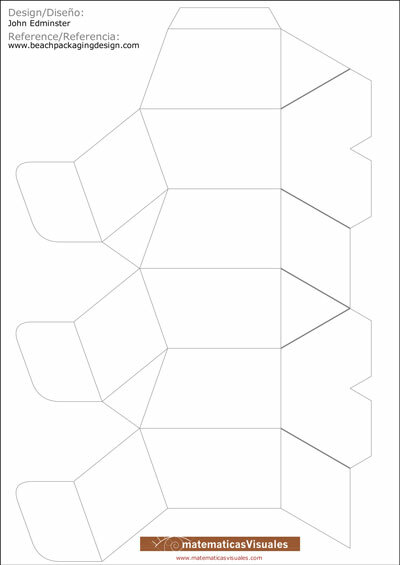 It can be seen as made by cutting off the corners of an octahedron. The stellated octahedron was drawn by Leonardo for Luca Pacioli's book 'De Divina Proportione'. A hundred years later, Kepler named it stella octangula. 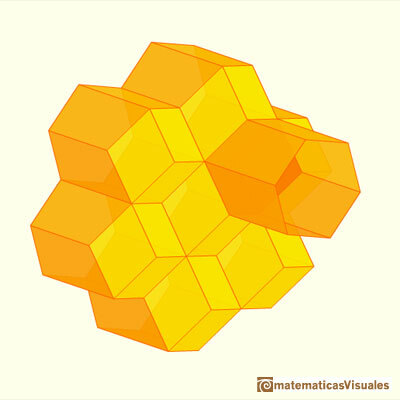 These polyhedra pack together to fill space, forming a 3 dimensional space tessellation or tilling. 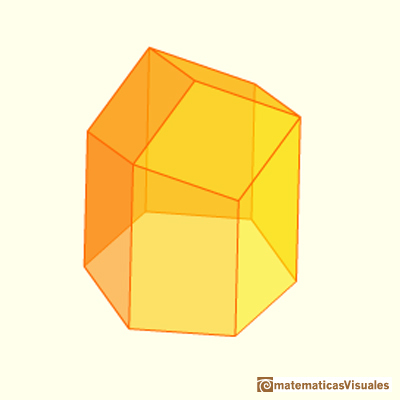 A Cube can be inscribed in a Dodecahedron. A Dodecahedron can be seen as a cube with six 'roofs'. You can fold a dodecahedron into a cube. If you fold the six roofs of a regular dodecahedron into a cube there is an empty space. This space can be filled with an irregular dodecahedron composed of identical irregular pentagons (a kind of pyritohedron).